Last year I took part in (i.e. 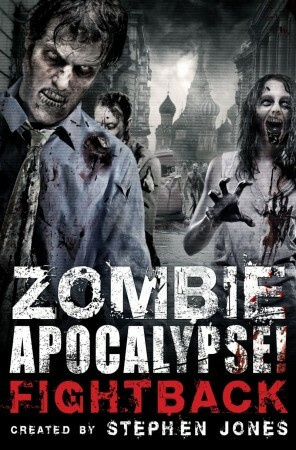 did the early-pages heavy lifting) for the shared-world volume ‘Zombie Apocalypse’. My role was to create a believable backstory for the plague that causes the world to turn zombie. Editor Steve Jones had come up with the idea, and was able to create a unique book comprising diary entries, radio broadcasts, notes, emails and ephemera – the sort of stuff left behind on a dead world – with each section designed differently. The result was a stunning-looking volume that went on to be a big success. The Hollywood rights were optioned (uniquely, to be shared between all of us) and a sequel was planned. Amazon readers complained that the ending was weak – but it had always intended to provide a jokey moment before a continuation, something they didn’t know. Also, creator Steve Jones had recently criticised in print a US horror festival, and I think he caught the backlash here. Either way, I thought the book was a great success. Now the second volume, ‘Zombie Apocalypse: Fightback’ is due out on October 4th, and promises to tie up what went before. The quality of writing is much higher than you’d expect for the subject matter, and a great deal of intelligent thought has gone into the series. I imagine there’ll be a third next year. BTW, the covers are unique to each country they appear in, with monuments and streets changing. I’m not a big Zombie fan – although I liked the old, old b&w Republic Pictures’ (?) Zombie films set in Haiti. Remember them? Torn clothing, big boots mostly, bad haircuts, one arm usually across the chest, the other out groping, dripping slime and climbing up out of the swamp and staggering on. (“Bullets aren’t stopping them!”) Each cursed soul looking for some more magic potion cooked up by the evil, but hot, Voodoo Queen. (“She’s pure evil, Tim! You have to accept that now.) The zombies didn’t go after brains then, I seem to remember, just a shot of the witch’s life sustaining brew. Instead, I’ve just pre-publication ordered (due in November here in the U.S.)three copies of The Case Book of Bryant & May, Vol. #1, for Christmas gifts. People I’ve hooked on B&M. NB Anna, there is another B&M coming and soon although a graphic publication! Back to struggling to ration my reading of the Invisible Code. I’m up to “Lucy” now – but it’s difficult, really diffic. I gave up trying to ration it and just went on to the end. Now I’ll go back and read it again. I’ve finished the second reading, even better than the first. What I like about these books is that you can read them several times and enjoy them just as much as, if not more than, the first time.